Unlike the Big Mac where the sauce is the key with White Castle burgers the key is the cooking method. The company itself describes the cooking as “steaming” rather than frying. The patties have 5 holes in each of them (have you ever noticed?) 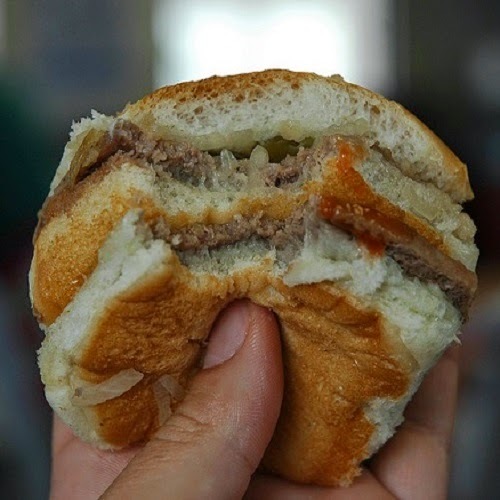 to allow the steam to rise through to the buns and allow the patties to cook without flipping. They also coat the grill with water (along with the onions) before putting the meat on to create more steam. All this makes it very easy for them to produce the 100's and 100's of burgers a day that they sell but very difficult for us to reproduce at home. But let’s try anyway, shall we? 1. Divide the beef into 16 equal sized pieces. 2. Form each into a 2-1/2 inch square, very thin patties. Do this on waxed paper. 3. Then “cookie-cut” five holes in each pattie. The pattern should resemble 5 on a dice. A CLEAN pen cap or small bottle cap works nicely. 4. Freeze these 16 patties. of onion for each patty you want to cook along with a little of the water from the onion. The onions should be spread into a single layer. 6. Immediately place frozen patty directly on top of onions and press down. When the meat is done, using a spatula, remove the three layers and grab the bottom bun. Flip it over and place it under the spatula. Slide the burger off of the spatula. If you have done it correctly, it should be perfectly completed. 9. Add a dill pickle slice and you are done. Photo of White Castle Double Slider is by Marshall Astor - Food Fetishist and is used by permission under the Creative Commons Attribution-ShareAlike 2.0 Generic (CC BY-SA 2.0) License.